Updated 10:22AM, Monday July 30th, 2012	by Sam Hailes, Christian.co.uk Be the first to comment! 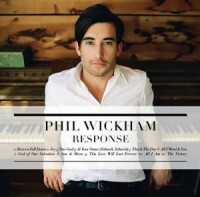 American worship leader Phil Wickham burst onto the UK scene shortly after the release of his free album Singalong. The idea was simple, one man, one guitar and 2000 people singing along. Thanks to well known Christians such as Mike Pilivachi, Vicky Beeching and Tim Hughes spreading the word about the free download, Phil’s songs Beautiful, Canons and Because of Your Love soon became favourites at UK festivals and churches. It was a series of events that took the San Deigo based worship leader by surprise. Phil began leading worship at the tender age of 12. “It is young, isn’t it?” Phil says, as if he’s just been told the news for the first time. Now Phil and his wife Mallory are building their own family. Penelope Maye Wickham was born late last year and is a “handful already”. Phil says that having a daughter has changed his life even more than marriage did three years ago. The 28 year old appears to be full of wise words. He talks about taking “every opportunity” but not wanting to pursue the secular music world right now. “I don’t think there’s anything more satisfying for me as a songwriter than writing a song that I hear people singing to the Lord.” He talks about “following the blessing of God” and being a “reluctant worship leader”. Signing to a record label was a difficult experience because Phil said he “wanted to”, but didn’t want to let that “want” get in the way of what God could be doing. “Being in the calling and blessing of God is where we all need to be,” he says, simply, revealing that the season proceeding his last studio album Response was "very sweet." "There’s a song called Joy," he says, "which is exactly what I’m talking about. I felt so satisfied in God and I still do. If you listen to my last record there’s a lot of hope, joy and excitement." Back to his acoustic Singalong project, Phil reveals there was never a grand master plan to do an acoustic record. But this changed after an opportunity to tour with David Crowder Band led to Phil playing his acoustic guitar with no band. “It wasn’t some big vision. God didn’t tell me to give it away free. I started talking about it with the guy who was helping me record it and he said, ‘Why don’t you give it away free?’ When he said that I knew immediately that was what’s supposed to happen. It felt so right. A night of people worshipping and people can have it for free and be a part of it. It's this desire to create something real and true to life that has influenced Phil's exceptional musical career. Whether it's his self titled debut, latest album or live records, there's something very special to be found in his music. Let's hope it's not too long before he's back in the UK doing what he does best.